This flavor-packed vegan dish takes just 15 minutes to make and can be made ahead of time. Perfect for potlucks and parties! 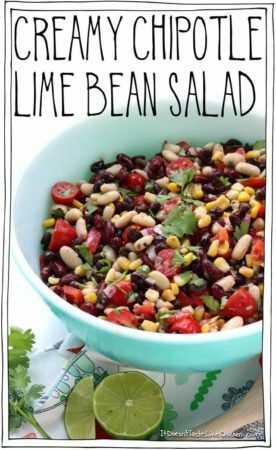 Add everything to a very large bowl, adding the chipotle lime dressing to taste. 1 batch of dressing will lightly dress the salad, where as 1 1/2 will have more punch. Toss well to combine. If making ahead of time, cover and store in the fridge for 1 - 2 days, and toss well before serving as the dressing will settle to the bottom.